Null alliances deploying to Factional Warfare lowsec is nothing new. But when it happens the locals certainly take note as it tends to shuffle the status quo. The Gallente-Caldari war zone has seen it’s fair share, with the likes of Ev0ke and Test Alliance Please Ignore, amongst others. It’s like that scene in any western movie worth watching: the new cowboy in town walks into the bar, the music stops and all the lowlife (!) clientele look up from their drinks. Two weeks ago Razor Alliance, a member of the CFC, deployed to Hallanen, smack in the middle of the war zone. The system is less than a handful of jumps from major Gallente staging systems as well as Caldari highsec. Razor declared their allegiance to the Caldari with great fanfare and propaganda, but did not enlist in Factional Warfare. Instead, they declared war on Gallente militia corporations and alliances. I caught up with Razor diplomat Dograzor, attempting to learn the nature this unexpected move from the alliance. Lowlife: Explain the circumstances that caused you to consider leaving Vale of the Silent. What was is that prompted you to look elsewhere? Dograzor: Prior to being deployed in Black Rise we were deployed on a campaign fighting X.I.X (Legion of xXDeathXx), a Russian sovereignty holding entity in the Geminate Region. Our campaign in the Geminate region was coming to an end as content was drying up, and we were exploring various opportunities for a new deployment. One of the opportunities was getting involved in the conflicts in the Faction Warfare regions, and that is why we ended up in Black Rise. Lowlife: In your recently released propaganda statement you declare that Razor will be fighting for the Caldari State, but you did not join Faction Warfare, preferring instead to wardec alliances within the Gallente Militia. Why did you decide to aid the Caldari and what was the motivation for not enlisting in FW? Dograzor: The core business of RAZOR Alliance is PvP combat and being a sovereignty holding alliance in nullsec, so we stand little to gain by actually enlisting into faction warfare. From the perspective of game mechanics, it would put us at a disadvantage as it will limit our access to highsec systems and various lowsec stations. This is not favorable when it comes to doing logistics (supplying ships etc.) and if we have non-Faction Warfare related operations going on. We also have no economic reason to enlist into Faction Warfare, as our home region of Tenal has enough opportunities for our members to generate income. The reason on aiding the Caldari State is that the Caldari militia are decidedly outnumbered in their fight with the Gallente Federation. RAZOR Alliance has the opportunity to leave its mark on the faction warfare space by putting its weight behind the Caldari militia, and turning the conflict into an even fight. We are here to level the playing field, and get good fights in the process. 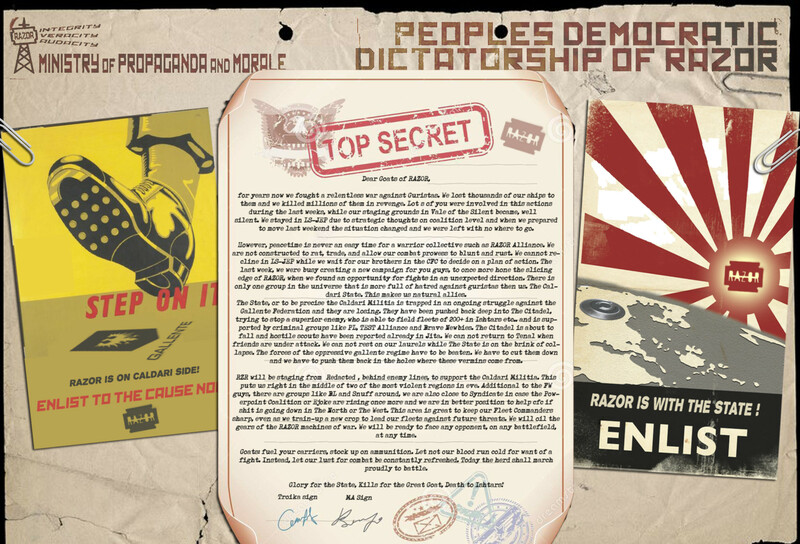 Also about the propaganda piece, we in RAZOR have quite a history when it comes to creating propaganda, it’s an old tradition that we have. If you are interested in seeing more of RAZOR’s propaganda, this video is one of our best pieces: http://youtu.be/wuREEonWGJ8 Lowlife: Why Black Rise and Hallanen? What was it about the area that made it attractive for Razor? Dograzor: If you have a look at the eve starmap, you can see that Black Rise/Hallanen is in jump range of various regions, so we can technically cover Placid, Syndicate, Pure Blind, Tribute, Lonertek, The Citadel, Sinq Laison, Genesis, Solitude, The Forge, Metropolis and Cloud Ring. This gives us a nice strategic location to deploy from. Lowlife: What is your impression of life in lowsec so far? Did it turn out as you had hoped? Has it provided the content you were looking for and how has the move been received amongst your membership? Dograzor: Lowsec is a different ballgame, and an interesting experience for the most of us.Time has yet to tell if we will find a lot of content, but from what I have seen so far is that there are plenty of small gang opportunities where our junior FC’s can step in and take out fleets. Numbers have also been good for this deployment, with quite some fleets going out on regular basis. Lowlife: How do you feel you have adapted to lowsec combat and meta? What are the challenges, if any, and how do you feel it compares to nullsec PvP? Dograzor: It is a bit early to give a conclusive analysis on how we are adapting to lowsec. It is a different area of gameplay altogether, and we are adjusting accordingly. One of the major differences is on the area of game mechanics, notably the inability to use bombs from stealth bombers and various forms of interdiction bubbles. This also reflects in the use of doctrines by the locals, the absence of bubbles and bombs enables people to use more expensive ships and/or in combination with high grade clone implants in relative safety. The use of tactics is also different in lowsec, notably the use of different Faction Warfare complexes and aggression mechanics. A prime example is how to tackle a ship on gate, in nullsec an interceptor is an excellent fast locking ship to get tackle, but this proves more difficult in lowsec if the interceptor wants to tackle a neutral as he will get gate gun aggression. This can give an extra challenge that we are adapting to. One interesting debate about lowsec PvP is the the matter of specialization versus generalization of doctrines. As a nullsec PvP alliance we have a very wide array of doctrines to combat various PvP scenarios, with factors such as long or short range, signature radius, speed, alpha, tracking, drone mechanics, ewar, supply availability, compatibility with allied doctrines, isk efficiency and shield or armor tank influencing the composition of the doctrines. I would say that we as RAZOR Alliance use and train for generalized doctrines. I am careful with the term “generalized” as I want to state that we use/train for a lot of specialized ships (e.g. most of us can use all racial battleships and tech 2 & 3 cruisers) but that we use those doctrines in a large scale generalized rock-paper-scissors warfare. In lowsec however, the absence of certain mechanics that can pose a significant threat (bombing, bubbles, player owned stations – no hellcamping) can enable players to use highly specialized doctrines that are ineffective in nullsec space due to the presence of above mentioned mechanics. For example, the use of command ship doctrines and faction battleships can be very viable in lowsec, especially when outfitted with expensive modules and implants, creating a very specialized composition that is harder to engage. This is certainly an interesting way of gameplay, and we are having fun discovering who brings what to the table and how to engage it. Lowlife: Obviously, your aim was to fight the Gallente Militia. Has this panned out as you had hoped? What kind of fights are you getting and what is your impression of the Gallente as an adversary? Dograzor: While the original intent was to play third party to Caldari generated fights, we have found it more comfortable to rely on what we might call more conventional means to generate fights, such as reinforcing structures and forming for timers. So far this has worked well for us and gotten us the type of fights that we have grown accustomed to. It is still too early to give a proper impression on the capabilities of the Gallente militia. Lowlife: Your move has certainly not gone unnoticed, besides the Gallente Militia, what other entities of note have you had engagements with? Dograzor: We have had a few encounters with Black Legion, who are no strangers to us, we have fought them on various occasions in the past. We had a good fight in Vlillirier, see http://bit.ly/1nsu5Y3 for the killboard result. 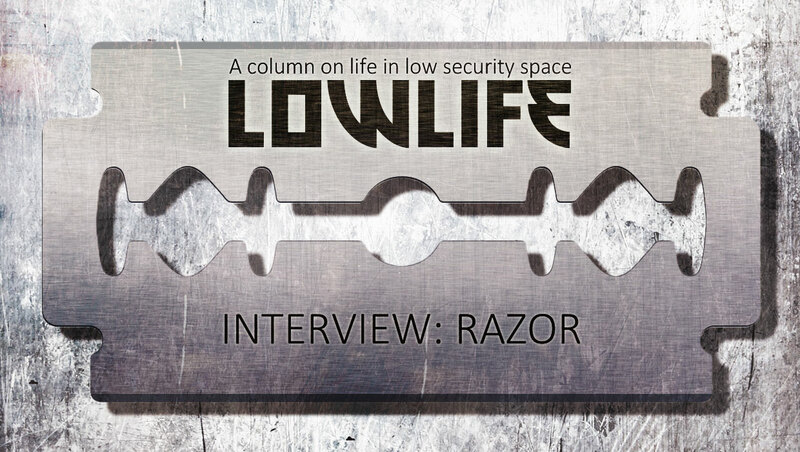 Thanks to Alice Karjovic from Repercussus corperation, we also have a video of the fight: http://youtu.be/uKQ9utXXKzU Lowlife: Is Razor intending to stay in FW lowsec for the short or long term? In other words, would you characterise it as a vacation from nullsec or something more? Dograzor: This I sadly cannot disclose in this interview due to OpSec reasons. Lowlife: How has your move to lowsec been received amongst the greater CFC? Do you feel that the relocation will affect your ability to support coalition-level operations? Dograzor: Currently there are no major nullsec conflicts happening that are closely related to the CFC, and content in nullsec is relatively sparse. If the CFC needs us to assist in a major conflict, we have the flexibility to adjust accordingly. Lowlife: Recently it has come to light that Black Legion are deploying to Tartoken, how will this affect Razor and your deployment in Hallanen? I realise this may be sensitive information, but can you say anything to address this? Dograzor: We’ve had some engagements with them as mentioned earlier in the interview, apart from that I cannot disclose much more about it. Lowlife: Is there anything you would like to add? Dograzor: Thanks for the opportunity to give an interview. – During the time of doing this interview, Black Legion have instigated what appears to be a war on the CFC. Tartoken is not far from Hallanen and it will interesting to see how Razor react to this new development. That could very well depend on what Black Legion decide to do and what kind of political pressure is applied from CFC leadership. The Caldari Militia may find their new ally is busy fighting their own war, the question is: will it come to Black Rise or will Razor pull up their stakes? You can follow Dograzor on twitter @evedograzor.